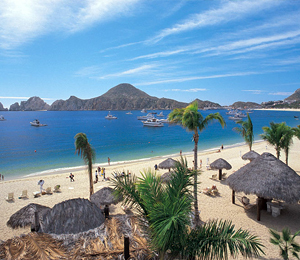 Cabo San Lucas has been one of the top vacation destinations for North Americans since mid century when John Steinback wrote a short story titled "Log from the Sea of Cortez" hailing the natural beauty and pristine gold beaches of the area. Quickly, Cabo San Lucas became known as a place for all types of fun and exciting leisure activities. Over the years, it has become known as a top destination for fishing, golfing, water sports, beaches, exotic wildlife, dining, and nightlife. In other words, Cabo San Lucas is one of the ultimate vacation destinations in the world, as it offers visitors the best of everything. What you will find when you come to Cabo San Lucas is beautiful and pristine beaches that are wide and expansive enough to never feel crowded. The local landmark is the Arco de Cabo San Lucas that is located at the southern tip of the peninsula and often referred to as "Land's End." El Arco de Cabo is a rock formation in the sea known for its distinctive formation, excellent snorkeling, and seasonal whale watching. Legend has it that the rock formations were used by pirates as hiding places from which to attack incoming merchant chips. Just next to the Arco is a popular tourist destination, Lover's Beach. This beach, known in Spanish as Playa del Amor, is one of the most picturesque beaches in Cabo thanks to its proximity to the arcs. Many celebrities come to Cabo San Lucas for their vacations, taking advantage of its luxury resorts and fantastic high class restaurants and shops. But even if you are not one of the elite multimillionaires of North America, Cabo San Lucas has plenty to offer you and your whole family. Along side the five star resorts, you will be able to find quaint and welcoming bed and breakfasts located right by Cabo's downtown area. Of course, by night you will be able to enjoy a variety of local bars and restaurants. During the day, explore your many outdoors options that include horseback riding, eco tours, fishing, parasailing, zip lining, ATV tours, snorkeling, scuba diving, and so much more!